I was introduced to the series Percy Jackson and the Olympians by Rick Riordan when I was teaching grade 3-5. 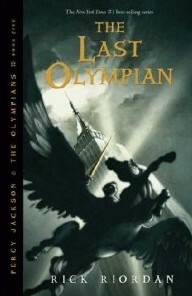 The series features a hero, Percy Jackson, who learns that he is the son of Poseidon, the god of the seas. Students in all of the grades I taught loved the story. These novels appeal to eight year olds as much as they do to fourteen year olds. A movie was made of the first novel, The Lightning Thief, and a second movie is in the works. These books are well-written and they provide an easy introduction to Greek mythology. Camp Half-Blood is the summer home for demigods. It is a place where the half-human children of Greek gods and goddesses can escape from the dangers of monsters that seek to devour them and where they learn the survival and battle skills necessary to survive in the world as demigods. Campers learn archery, and swordsmanship and chariot-driving and many other martial skills. They play games of capture the flag, in which they have the opportunity to put their skills to use. Camp Nominingue is not Camp Half-Blood. There is no threat of mons ters beyond the borders of the camp! 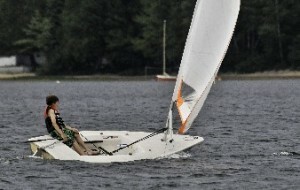 Campers choose to come to camp and their survival is not at risk while they are at camp. At Nominingue, campers do learn outdoor skills on the water: windsurfing, sailing, kayaking and canoeing; in the woods: campcraft, orienteering, nature studies and outdoor cooking; and other land skills: woodworking, archery, climbing and mountain biking. The games that take place throughout the summer such as Pony Express, the Tribal or the Voyageur Games enable campers to put some of their skills to the test as they challenge themselves to excel and compete for fun. Canoe trips are the ultimate proving ground. Campers paddle their canoes across a windy lake, portage packs through the woods, set up camp and build fires upon arrival at a campsite and cook their own meals over an open fire. At Camp Half-Blood, campers are trained to be heroes by the gods. The Greek gods use heroes to impact the world in which the demigods live. The goal of the campers is to set off on a quest and to return to camp victorious. At Nominingue, campers don’t need to be heroes. Every camper has the opportunity to learn new skills, to make new friends, to gain confidence and develop his independence. Like at Camp Half-Blood, the camaraderie and relationships that are developed at Nominingue are strong ones. Friendships that develop at camp frequently last a lifetime. The counsellors, although not heroes, are outstanding role models for the campers under their care. Some counsellors love canoe tripping and excel at rolling up a canoe; other counsellors instil a love for the plants and trees that surround us; others are creative story-tellers; others are supportive problem-solvers…Each counsellor has the opportunity to impact a camper in a different way. The relationships that develop between campers and counsellors over the years are also special and contribute to what makes Nominingue a special place. Although it is not Camp Half-Blood, in its own way Camp Nominingue is just as special. Through the skills that campers learn, through the friendships that they develop, through the challenge that canoe trips offer, campers live an experience that impacts them for the rest of their lives.